Nick Vannett isn’t the oldest guy in the Seahawks’ tight end room. That honor falls to free agent signee Ed Dickson. But he is, despite having played in just 24 games in two seasons with six starts, suddenly the leader of the Seahawks’ tight end corps, the only one on the roster who has played in a game for Seattle (unless you count the two snaps Tyrone Swoopes got last season). 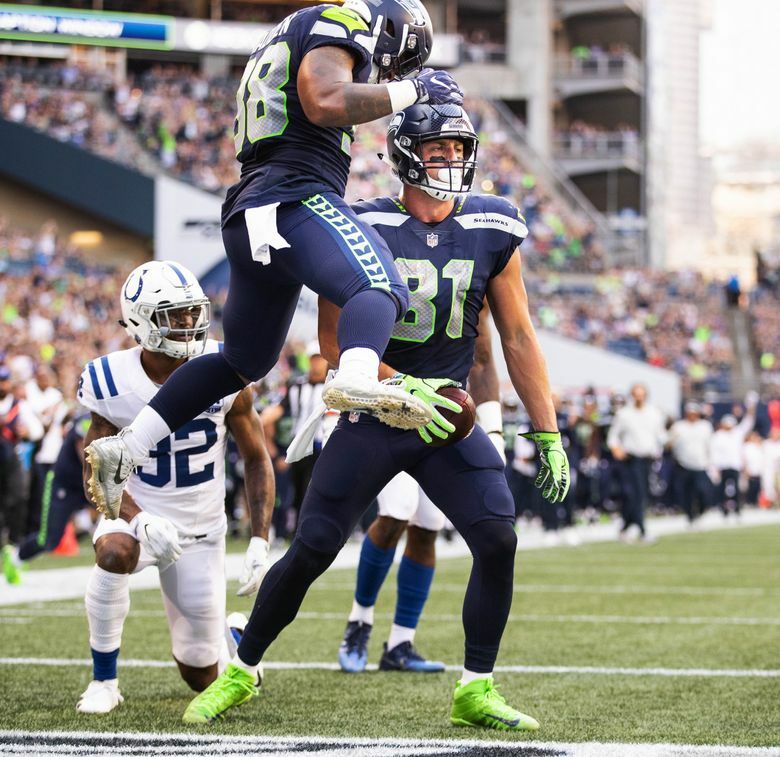 And when Luke Willson and Jimmy Graham departed via free agency in the offseason, they also left Vannett with a most important task — as the arbiter of the tight end group’s elaborate structure for levying fines on each other for any number of offenses. As Vannett explained it recently, anyone in the tight end room (including position coach Pat McPherson) can be hit with what is called a “homeland fine” if they are caught wearing clothing related to their school or hometown or state. There’s also an Uncle Rico fine (named for the fictional character in Napoleon Dynamite) if someone veers off topic to start talking about their school days or something similar (Vannett says McPherson has been the one most guilty of this offense). Then, there’s also an “initiation fine” when someone new joins the team — Vannett said rookie Will Dissly of Washington had to pay $1,000 after signing a contract that included a $650,268 signing bonus. The initiation fine is determined based on how much the player has signed for. A typical fine, Vannett said, is $20. At the end of the year, half of all the money collected goes to a charity the group chooses while the other half goes to fund a year-end group trip. Last year, if there were disputes about what and wasn’t a fine, it fell to Willson, who had been with the team since 2013, to settle the issue. But now that Vannett is the most senior Seahawk of the six tight ends on the roster, he gets the final call. Dissly, he said, has been the biggest offender so far, racking up fines of about $2,700 (Vannett said they may lessen the damage in the regular season to $10 an offense). It’s all in continuing the traditions established by those before him, Vannett says. But, aside from keeping the fine tradition alive, Vannett knows what’s more important is trying to replicate what Willson (now in Detroit) and Graham (now with Green Bay) did on the field. Even when Dickson gets healthy, the Seahawks will count on Vannett to assume a more significant role than in the past, not only to potentially produce as the number two tight end, but also because new coordinator Brian Schottenheimer’s offense will demand more from the tight ends. The good news is that Vannett has never felt healthier or more prepared to assume that challenge. Vannett learned a lot about the NFL over the past two seasons, but in the last few months, he also finally figured out what was causing a nagging lower back pain — a herniated disc — that has ailed him for most of his time with the Seahawks. Vannett didn’t have surgery but said a prescribed exercise and treatment program has done the trick. He felt it pay off last Thursday when he played a starring role as the number one offense drove for a touchdown on Seattle’s first series of its preseason opener against the Colts. Vannett first caught a 15-yard pass on third-and-16 to set up a fourth-and-one conversion on the next play, in which his blocking was a key. A few snaps later, he caught a five-yard touchdown pass from Russell Wilson, moving to create just enough space to get open as Wilson roamed to his right. Vannett, however, realizes there’s a long way to go before he can truly say he is picking up where his predecessors left off.